In Syria, what began as another chapter of the Arab Spring has deteriorated into a humanitarian catastrophe. 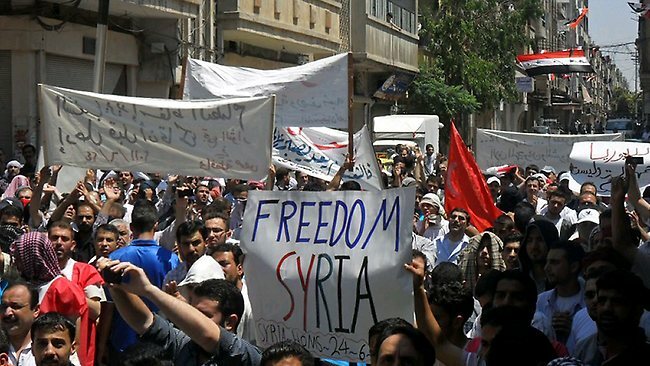 Protests starting on March 15th, 2011 were met by the reigning Assad regime with violence and mass arrests. The uprising became a full-scale civil war, resulting in over 100,000 casualties and the displacement of millions. Regime and allied air raids on rebel strongholds frequently result in numerous civilian deaths and massive damage to infrastructure. Army sieges on entire towns prevent access by humanitarian groups to provide necessary food and medical assistance to besieged Syrians, resulting in widespread malnutrition and disease. Jihadist forces have capitalized on the country's instability to wage successful campaigns against the Syrian army and anti-government armed factions, seeking to carve out an Islamic Caliphate. Warning: The videos presented can be extremely graphic.